HealthWell provides full training courses designed to meet and exceed any legislative requirements, leading to staff certification in each area. Additional in-service training courses are available at no cost for clients or at a minimal cost. Description: This 30 minute presentation is geared towards front line workers and provides information on the legislative changes that are now driving the approach to service delivery in long term care settings. Identify the negative effects of not utilizing this approach. Description: This 30 minute presentation gives information on caring for residents with urinary catheters and preventing urinary tract infections. Description: This 45 minute presentation gives information on interventions to maintain and improve communication and independence of residents who are cognitively impaired. Practical strategies to address challenges in long term care settings will be discussed. Description: This 45 minute presentation gives information on risk factors for falls and interventions to prevent falls. Description: This 45 minute presentation gives information on assisting residents in the dining room, feeding residents, and protecting residents from choking. Description: This 30 minute presentation gives information on work practices that promote infection control. Description: This 30 minute presentation gives information on promoting adequate nutrition and hydration in the elderly. Description: This presentation gives information on how to protect the wandering resident and optimize his quality of life. Description: This 45 minute presentation gives information on causes, signs, and symptoms of pain, pain indicators in cognitively impaired residents, and interventions to help alleviate pain. Description: This 30 minute presentation gives information on consequences of limited range of motion, and how to safely perform active and passive range of motion exercises. Description: This 30 minute presentation gives information on reducing restraint use and using restraints safely. Description: This 30 minute presentation gives information on interventions to maintain and improve communication and independence of the resident with sensory or cognitive impairments. Description: This 45 minute presentation gives information on preventing pressure ulcers and skin tears. Identify positioning and pressure redistribution surfaces that aid with maximizing skin integrity. Description: This 45 minute presentation gives information on preventing back injuries and how to safely lift and transfer residents. 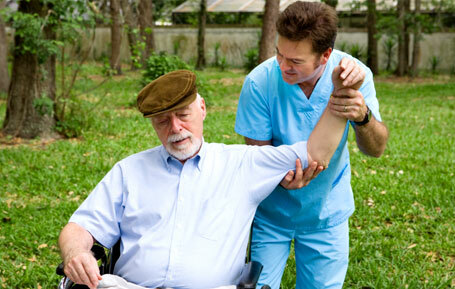 Demonstrate proper placement and removal of a transfer sling under a resident who is in bed or in a wheelchair. Description: This presentation gives information on types of urinary incontinence, and gives interventions for maintaining and improving continence. Demonstrate an understanding of assessment and documentation required.